Misty, Princess of Beldora, doesn't want to spend her days pondering marriage or what to wear to a ball. Instead, she wants to avenge her mother who was abducted by Badlug, tyrant of Grimoire. 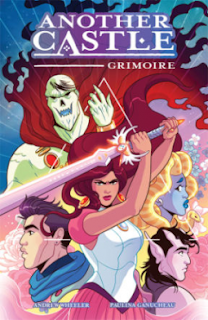 As history repeats itself and Misty is captured to be the next queen of Grimoire, Misty vows to save herself and protect her kingdom and newfound friends. Another Castle is rich with a colorful cast and stunning illustrations. Misty is one princess I wouldn't want to cross, and she serves as an inspiration to young girls who want to be their own person. Into the Dark Lands meets classic fairy tale in this adventurous collection where the princess saves herself and makes lasting friends along the way!